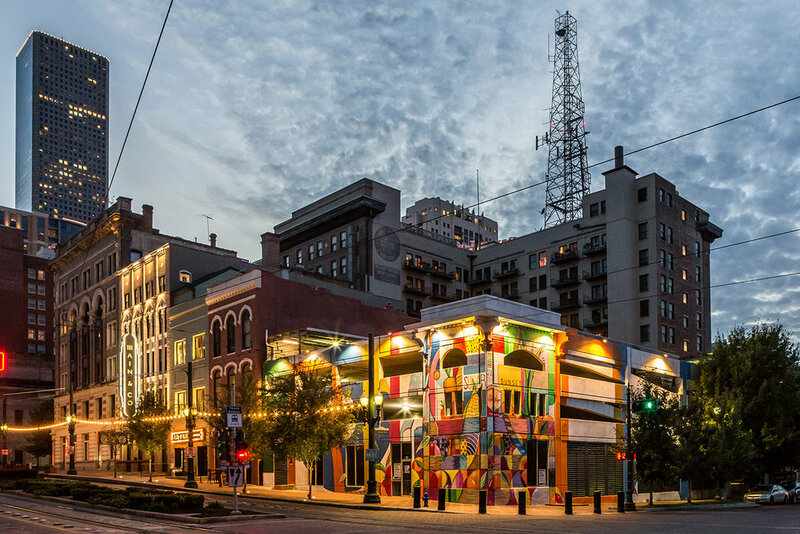 Dual, an urban contemporary artist from Houston, recently completed a 7,000 SF mural on a three-story parking garage located at the southwest corner of Main St and Commerce St in the Downtown District. 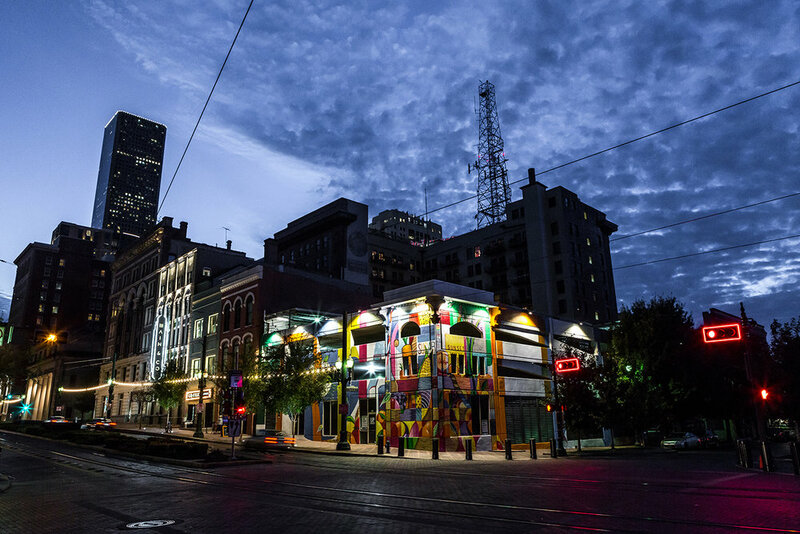 Anchoring the new Main & Co. development, and across the street from University of Houston-Downtown, “Produce Row”, is proximate to the site where Houston’s first farmer’s market emerged in the 1870s, and is dedicated to Commerce Street’s history. The mural was painted on the façade of UP Art Studio’s pop-up shop, which currently serves as the art organization’s temporary HQ, who has a history of working out of vacant commercial donated spaces. UP Art Studio, in partnership with LCD Gallery, produced the mural as part of the presentation of the “All CAPS” exhibition, which took place on October 6. “ALL CAPS”, which is currently on view, highlights five international artists and the dualities of their street and fine art practices. The exhibition highlights the use of aerosol as a productive medium and the growth of street art as a modern art movement. “All CAPS” features global street artists Blek Le Rat, Ben Eine, Denial, Sen 2, and Houston-based artist Dual. 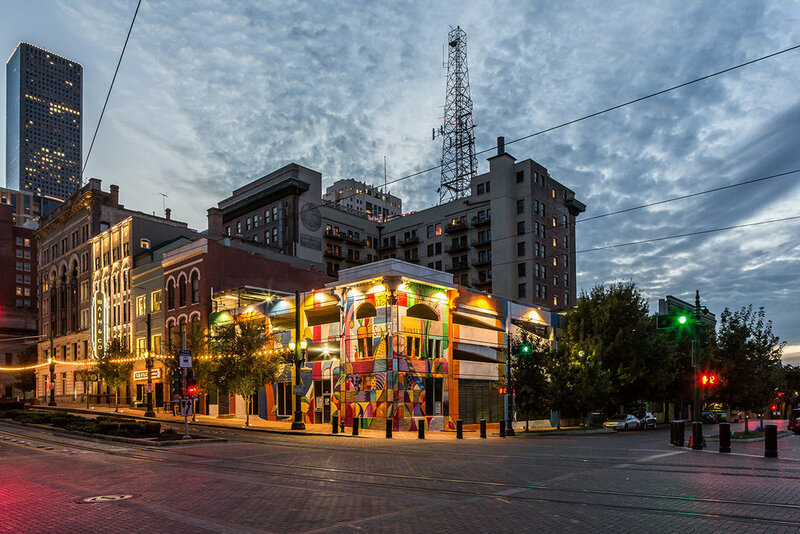 The mural was made possible through the generous support of Dual, Akzo Nobel (who donated the paint for the project), a private sponsor for the lift, and Bayou Lofts and Main & Co. (who sponsored the lighting of the mural, and donated their walls).